Updating to the 0.3.4 version of dblatex has fixed many of the issues detailed in The Aftermath (end of this blog post). See the blog post for more information. You’re writing a book in DocBook XML, publishing it with dblatex, and you dislike (or want to customize) the fonts it uses in the rendered PDF. The dblatex documentation shows you how to set your fonts, but you can’t seem to get it to work. What do you put in for the names anyway? Do spaces matter, or do you enter file names? Where do you install the fonts? OTF, TTF? What type of font must they be? Does the TeX engine even support this? Caveat: I can verify that this solution works for TTF type fonts, I can not comment on how well it works for other font types. The Font Manager application (package: font-manager) also provides a graphical way to install font collections. Rebuild your font caches with the fc-cache -f -v command. If I recall correctly, you need to have super user permissions to run this. I may be wrong though. We need to use XSLT stylesheets to define what our chosen font families are going to be. In this example I’m using Source Sans Pro for the body font and Source Code Pro for monospaced sequences. -p xsl/dblatex-pdf.xsl: This tells dblatex that we’re providing a “user stylesheet” to use when transforming the XML. This stylesheet only has our font customizations in it, but you can put much more in them than just that. After this, dblatex runs any custom post-compilation scripts, and then hands the intermediate file off to xetex where it is finally transformed into PDF format. 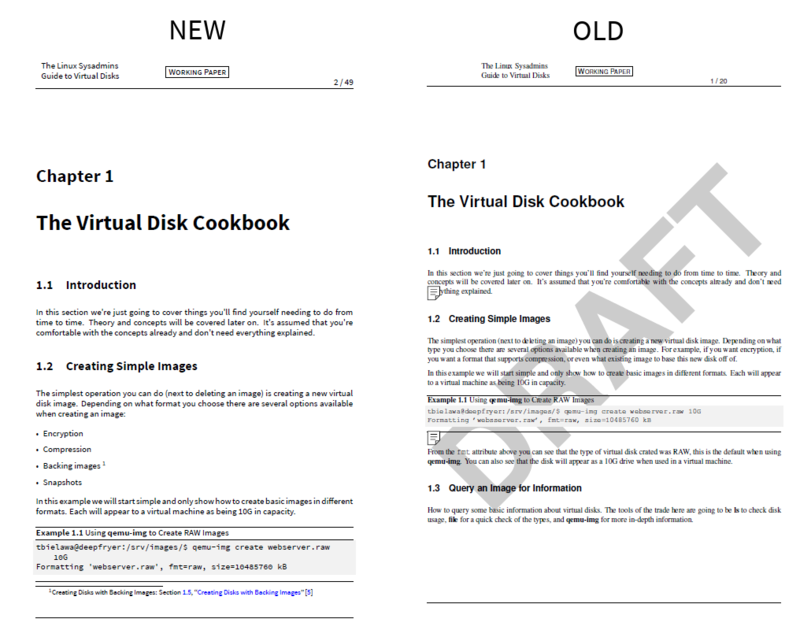 On the left is the book rendered with xetex and the new fonts. On the right is the book rendered with pdftex and no special font customizations. The only thing that really bothers me is the broken word-wrapping character. I can deal with the others breaking. I had intended to remove them from the final product anyway.